This weekend, I hosted a taco party for pre Cinco de Mayo celebration. Quick background on the holiday, May 5th commemorates the Mexican army’s 1862 victory over France at the Battle of Puebla during the Franco-Mexican War. In the US, this date is observed as a celebration of Mexican heritage and pride, which in present day loosely translates to people drinking a whole lot of tequila and cerveza — “Cinco de Drinko” as Natalya calls it. For our NYC Cinco de Mayo Fiesta collection post, click here. After two long hibernation weekends, I decided Cinco de Mayo weekend was the time to get back into society. And plus, hosting a dinner party is a good compromise because I could be social without having to leave my flat. My menu consisted of Skirt Steak Tacos with Guacamole and Pice de Gallo, Pulled Duck Tacos with Mango and Pineapple Salsa, and Vegetarian Enchilada Casserole. All were very quick and easy to make, it took about 3 hours to prep and cook enough food for 15+ people. I chose to do skirt steak because it is super quick to cook. You can easily just season the steaks with salt and pepper and grill it, but should you have time to marinate it, always do it. I prepared a Thomas Keller marinade from his Ad Hoc at Home cookbook composed of toasted thyme + rosemary + bay leaves + peppercorns + garlic in olive oil. I let the meat marinate for couple hours, removed the marinade, seasoned with salt and pepper, and then cooked in my cast iron grill pan. 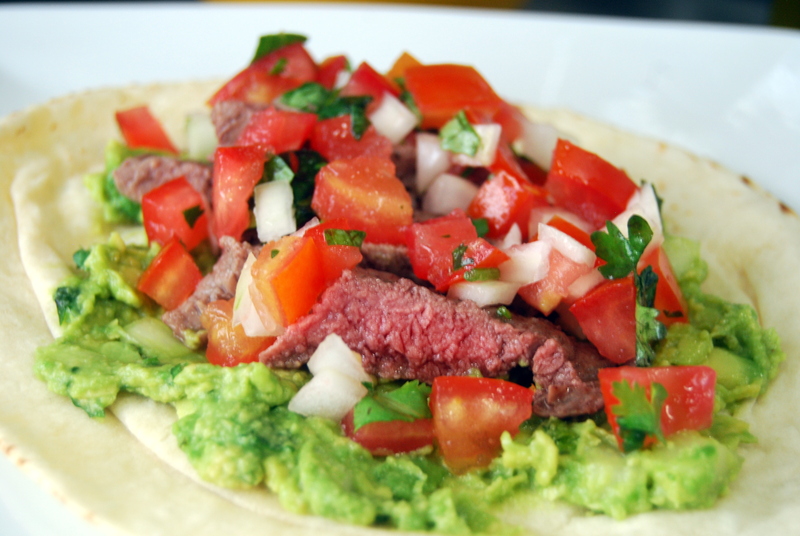 I assembled the steak tacos with some homemade Guacamole and Pico de Gallo… very simple and very delicious results. 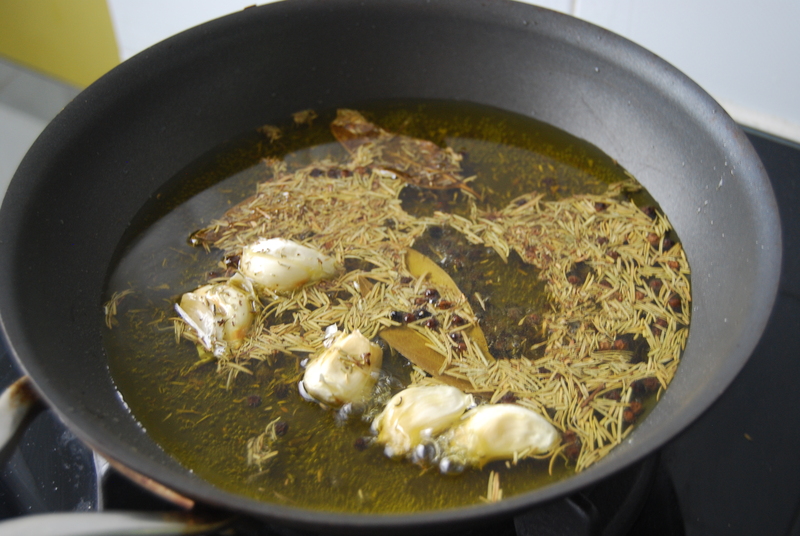 To prepare the marinade, combine the thyme, rosemary, bay leaves, peppercorns, garlic and oil in a medium saucepan and bring to a simmer over medium heat. Remove from the heat and let the marinade cool to room temperature. 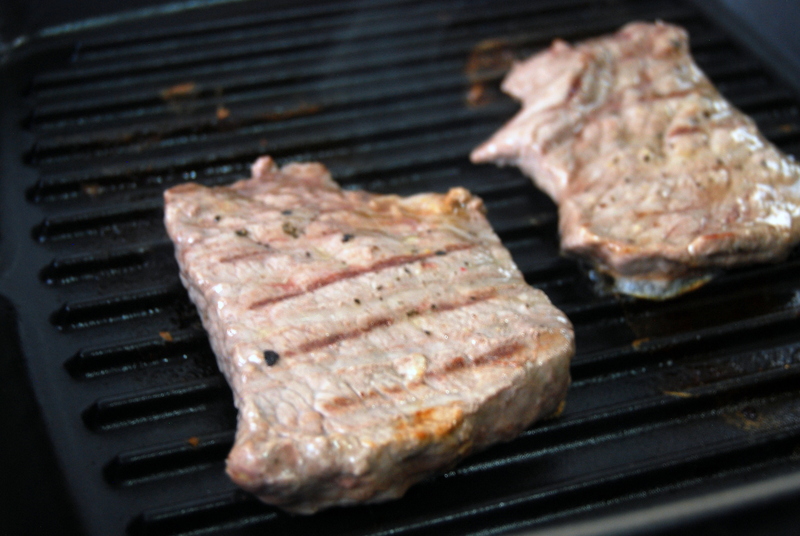 Pull away any excess fat from the skirt steak and discard. I had my butcher already do that and cut them into individual steaks of 1/2″ thickness. 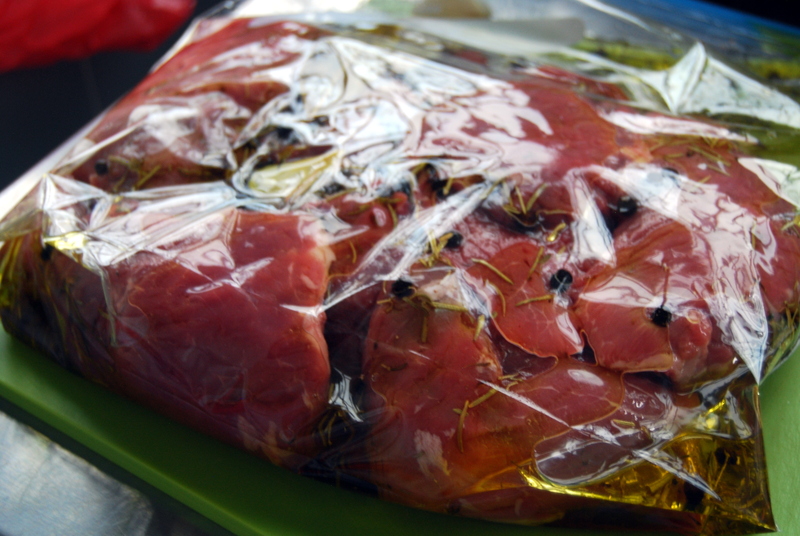 Put the steaks in a resealable plastic bag, add the marinade and seal the bag, squeezing out any excess air. Marinate for at least 4 hours, or for up to a day, in the refrigerator. ** I always prefer marinating in Ziploc bags versus a covered dish because it takes up less space in the fridge and much easier to clean up (aka just throw it away after). Removed the meat from the marinade and let sit at room temperature for about 30 minutes before cooking; discard the marinade. Dry the meat with paper towels. Season with salt and pepper. Heat some canola oil in a large frying pan or grill pan if you have. When it shimmers, add some of the meat and quickly sear the meat on both sides. I cooked it about a minute on each side for medium rare. Let the meat rest for a bit before slicing. 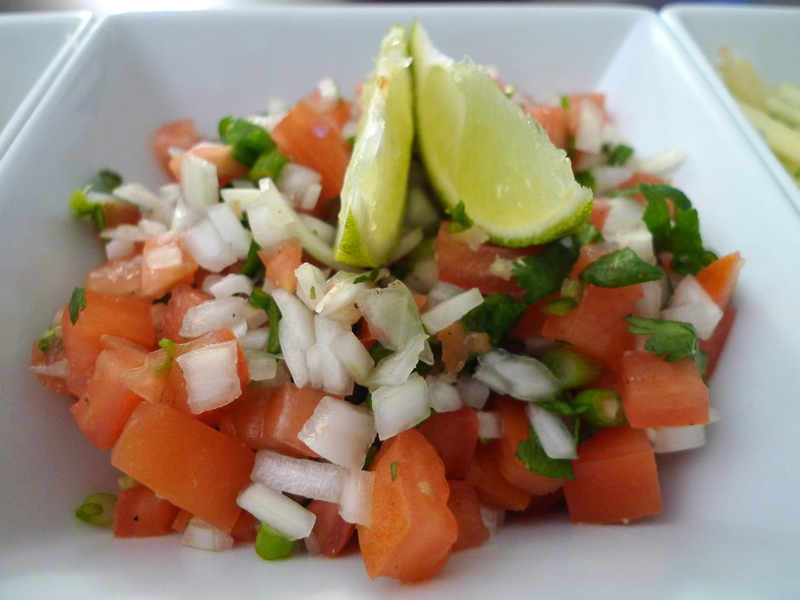 When slicing the meat, cut it against the grain and preferably into thin slices for tacos. Assemble the tacos by first putting a base layer of guacamole, add some skirt steak strips, and then top it with pico de gallo. Squeeze some fresh limes on top and enjoy!